LAS VEGAS: The International Consumer Electronics Show is still a marquee event for a growing range of brands to promote their products, despite some Silicon Valley giants saying it no longer fits their strategies. Although Apple and Google don't exhibit at the event and Microsoft said this year's keynote will be its last, other companies have stepped into that void as the show's focus shifts to include more brands from the home and lifestyle, automotive, health and fitness, and healthcare fields. The high number of attendees and the range of brands presenting on the show floor and at keynotes, press conferences, and sessions, make the conference valuable despite the absence of some tech titans, says Rick Murray, president of Edelman Chicago. “The simple reality is this: as long as you have 140,000 geeks in one place, a lot of business is going to get done,” he says. However, he adds, brands must break through the clutter of myriad product announcements happening at once. Jeff Leopold, director of PR at Sharp Electronics, contends that the show is an important event for his brand to interact with reporters and retailers because of the high volume of journalists attending. To that end, Sharp revamped both its booth and press conference environment for this year's show to facilitate easy one-on-one meetings with reporters. Its press conference attracted nearly 450 members of the media, he reports Leopold. Kimberly Assalone, VP at Ketchum, agrees that the large-scale media presence at the show drives awareness for companies that want to use it as a launch pad for new products. "You have a captive audience that is here looking to write stories about the news of the show, and that is a huge asset,” she says, adding that it increasingly attracts media from the lifestyle, home, and entertainment sectors. "It's not the CES of years ago where it was really just the techies… especially with tech moving into our everyday lives with cars and appliances. It's just broadening the spectrum." Although Apple, the tech sector's biggest blue chip, was not at this week's CES, six of the world's 10 largest automobile manufacturers exhibited, says Laurie Ann Phillips, senior director of communications at CES. She adds that this year's event was the largest in CES history and media attendance was at least as high as last year. Phillips also contends that many tech companies that do not present at the show continue to attend to keep an eye on the competition. Apple reportedly had more than 200 employees registered for this year's edition. 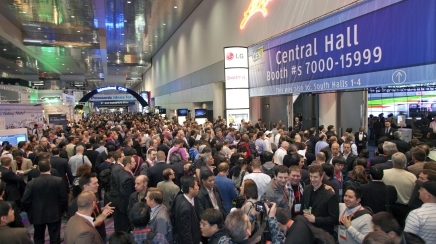 "Every tech company in the world is here at CES in some way, shape, or form," Phillips says. "Even if they're not in an official show directory, if you take a look at our attendee registration and the people that come, we know that they're here and that they're making business happen with the other companies that are here." Assalone agrees that scheduling a major announcement at a different time of the year allows for more freedom with scheduling and provides a clearer path for rising above the clutter of announcements. However, she adds that CES' massive scale also has advantages that can't be found in other places, such as the large international audience. "You're also able to both meet with the media and have your business meetings at the same time,” she explains. “If you look at it from an events perspective, you don't have to create different events for media, buyers, resellers, and distributors. It's all under one roof."